I have a brother who lives in Southern California and has pomegranate trees! We were very happy to get a box of maybe 14 or 15 pomegranates from him today. Some were slightly bruised, so my daughter and I immediately got to work in carefully removing the lovely ruby kernels of about a half dozen. I was thinking of making something of them in a main course tonight and naturally my mind turned to one of our favorite local restaurant dishes, fesenjan pomegranate and walnut stew with tempeh (the recipe appears in an article from early 2007) from Chapel Hill's lovely Persian vegetarian Sage Cafe. But, instead, I thought to make a rice and lentil dish sprinkled with pomegranate and pistachio. 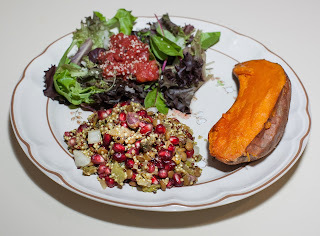 Subsequently, in thinking about the texture (something that I often consider in the meals that I create), I changed my mind to quinoa instead of rice, as I thought that the "give" of the softer grain would work better juxtaposed with the pomegranate. In a 2 or 3 quart stainless steel pan (I use SaladMaster titanium-stainless pans) with no added fat, liquid, or anything else, I put in the first group of onion and turned the heat on to medium. A good stainless won't have much food stick to it, if you keep the heat no higher than medium or medium-high, stir, and, if necessary add a little liquid as the food cooks. There is no need to preheat if no oil is involved. As the onion began to carmelize as I frequently stirred (after about 5-7 minutes), I first added the broccoli and second batch of onion, then a minute later added the cumin. I constantly stirred (one doesn't want the cumin to burn!) for about half a minute. I then added water and lentils. I used organic green lentils that normally cook in a 1 part lentil to 3 parts water over 30-45m, but I used a little less water as I knew I'd be adding more water with the quinoa. I already had the water boiling in a tea kettle to hasten the process, but it could just be added cold and warmed with everything else. At this point, I also added the bouillon cube, turmeric, and salt. I prefer no added salt or minimal salt and nowadays don't typically add even salt (or margarine) to baked potatoes. But my wife has recently been wanting more salt, so I've been a bit more generous with my use of salt. I cooked, uncovered and stirring every now and then, for about 20 minutes. I added the quinoa and (already boiling) water; normally quinoa cooks in a 1:2 ratio, but I used a slight bit less water. I also added the peanut butter. I continued cooking over medium heat, stirring now and then, for another 8-10 minutes till the quinoa showed its characteristic spiral shape, indicating it is done. A taste sample confirmed that both the lentil and quinoa were done. I served the (not very liquidy and hence not runny) stew with a baked sweet potato and a simple salad of mixed greens, stewed tomato, and hemp seed. I was pleasantly surprised; not due to anything really that I did, but with these ingredients, how could it not be good? But my wife claimed it was one of the best meals that she has had (I suspect she is forgetting many meals we've had!) and my daughter liked the stew. I wish that I had cooked with pomegranate in the past, but don't think that I have. I enjoyed the nuanced flavors and the slight hint of the flavor and heft of peanut. The pomegranate added a lovely texture and color, and played off of the pistachio, two ingredients common to Iran. As a Food for Life instructor, I nowadays normally cook no-added-fat meals. In the FFL curricula, we recommend not just a fully plant-based diet, but one that has no more than about 10% calories from fat for preventing disease and maintaining good health. Of course, caloric needs vary, but I roughly aim for myself to be around 20-25g of fat per day. So, no oil in this dish, but I did add a tablespoon of peanut butter (7.5g of fat) for a nuanced flavor, and, of course had the pistachios (3 pistachio kernels is about a gram of fat, so about 8 more g of fat). We didn't finish the dish but overestimating the fat content to 20g of fat, that's still about two adult 8g of fat servings and my daughter's smaller 4g of fat serving were we to have eaten it all, so it wasn't so bad. Pomegranate is a good source of fiber, folate, Vitamin C, Vitamin K, and many trace minerals such as potassium, manganese, and phosphorus. It may be a good anti-oxidant. Of course, broccoli, quinoa, and lentils are very healthful for many reasons. I happened to have a little bit of broccoli, so decided to use it up and knew that cooking the stalks down would make their nutrition tastily available. I need to cook with pomegranate more, and also more often play with sweet-savory combinations. We already have tentative Thanksgiving (we sold over 600 seats the first day we were open for reservations!) menus in place, but I may include this stew for Thanksgiving next or future years. Sounds absolutely delicious and so healthy. I have all the ingredients, save the pumpkin seeds. I'll be buying tomorrow and making your creation. Thanks!!! Thanks, Joanne! BTW, I think you mean pomegranate and not pumpkin. I can't wait to hear how yours turns out!